It has been a while since I posted this about our first step toward potty training our daughter. 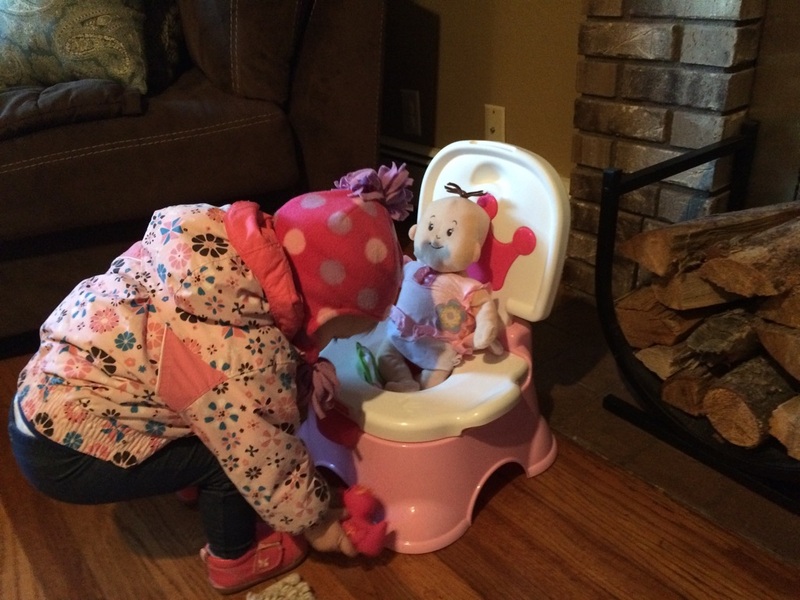 We purchased the potty chair and she has used it a few times, but we really haven’t pushed the issue. “You have to wait until they’re ready,” is what I keep hearing and so, since she is only 19 months old, I held back. Then, a few nights ago, while she was playing, she abruptly dropped everything and hurried to the bathroom. We took this as our cue that she’s ready to get rolling. I anticipated my daughter would be somewhat frightened of the real toilet so I thought the potty chair would help ease her into the idea of using the toilet. Instead, she is obsessed with the real toilet. She loves everything about it: Sitting on it, flushing it, throwing copious amounts of toilet paper in it, throwing Mommy’s water bottle in it. 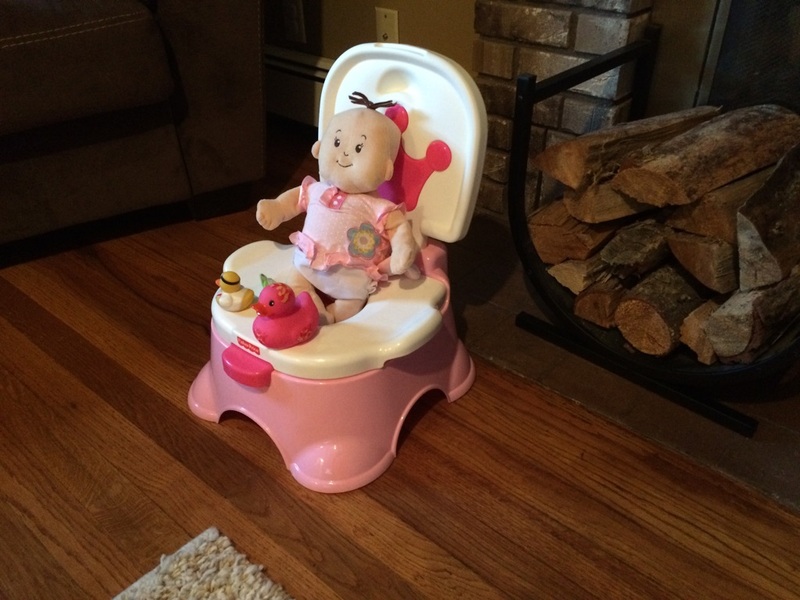 But luckily she is potty training her baby at the same time so the princess potty chair won’t go to waste. My daughter even brought the potty chair to the living room (clean, thank goodness) for the baby to use. This also allows the baby to catch up on episodes of How to Get Away with Murder while she goes. It helps that my daughter’s daycare center is great about starting potty training early on. We are trying to be consistent with that at home, but I have yet to place any real expectations or goals (totally unlike me). I feel that at her age, it is appropriate to give consistent opportunities to potty like a big girl without any pressure or stress and with plenty of praise when she does go. If you are in the middle of potty training your child, here is a helpful info sheet. I would love to hear from you: At what age was your child potty trained? Any advice? My son was 3 years 8 months. It was rough. Just keep with it. Consistency is the key. I definitely need to work on being more consistent. Thank you! All the best on your progression. Take care! Thanks so much! I will check that out. I woke up on a Friday morning, and decided I would try it. So I vowed to not leave the house for 3 days. I spent the first and second day not really letting her out of my sight- and toting the potty chair around in every room- while she ran around naked. I literally asked her “do you need to potty?” like every 5 minutes… LOL! I was not originally planning to do overnights right away… But after that first day- she woke up crying “potty” so I then decided no more diapers AT ALL. The third day, I put the potty in one spot, and that’s where we went every time she would respond “yes.” She hasn’t had a single accident since the second day. I skipped the pull up stage because I, personally, feel like that confuses them. Magic trick? No. Pure luck.